One of the ways to encourage participation from the people towards Energy Efficiency at home is through contest/competition. I know we have had this SAVE Program whereby the government gives out RM200 rebate for purchase of efficient refrigerators and RM100 for energy-efficient air-conditioners quite recently. It was a decent effort but for some unknown reason it was not that popular. There is this competition to promote energy efficiency at home in the State of Massachusetts, USA, that caught my attention and the very similar concept can be adopted by our Local Councils here in Malaysia. 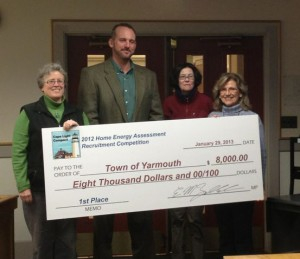 In that competition, CLC, an intergovernmental organisation in Cape Cod & Martha's Vineyard region invited individuals and organisations to recruit and invite households to sign up for free energy assessment through “Home Energy Assessment Recruitment Competition”. Each household that went through with an energy assessment was allowed to vote once for the town or organization that recruited them. Town or organization who recruits the most energy assessments will win our top prize of $8000 (approx RM24,000). After a period of 6 months, votes was counted and Yarmouth town won it with 77 votes beating 16 other towns and organisations. All participating towns and organisations receive money as long as minimum requirements are met. Pic: Reps from the winning town. CLC (Cape Light Compact) photo. Find out more about the fun and fulfilling competition here. This competition is interestingly engaging and can be adapted to our Energy Efficiency campaign in Malaysia. For a start, Energy Commission may want to collaborate with the Ministry of Local Government and Housing (under Datuk Hajiji Hj. Noor) to carry out competition at municipal level. A green Chinese New Year. Rainfield - have a great celebration, you and your family! Keep the pix coming.